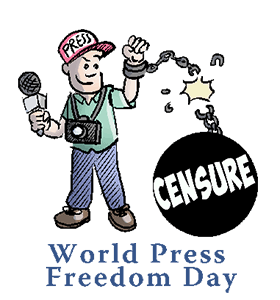 ﻿World Press Freedom Day: Calendar, History, Tweets, Facts, Quotes & Activities. World Press Freedom Day acts as a reminder of the importance of a free press in a functioning and safe society and serves to commemorate the journalists who have lost their lives in support of free press. In a time when media coverage is prone to fear-mongering and sensationalism, taking the time to appreciate and seek out journalism with integrity has never been more important. Freedom of expression is a fundamental human right as stated in Article 19 of the Universal Declaration of Human Rights. World Press Freedom Day was first organized by the United Nations General Assembly in 1993 in an effort to reflect upon press freedom in the world. The day marks the anniversary of the Declaration of Windhoek, which is a statement of press freedom principles put together by African journalists in 1991 to promote an independent and pluralistic African press. This holiday is celebrated on May 3. Each World Press Freedom Day has a theme and a host city. 2017’s host city is Indonesia, Jakarta and the theme is Critical Minds for Critical Times: Media’s role in advancing peaceful, just and inclusive societies. The theme was chosen as it coincides with the 2030 Development Agenda goal to: Promote peaceful and inclusive societies for sustainable development, provide access to justice for all and build effective, accountable and inclusive institutions at all levels. UNESCO confers the Guillermo Cano World Press Freedom Prize to a deserving individual, organization or institution in the field. The prize is named after Guillermo Cano Isaza, a Colombian journalist who was assassinated outside his newspaper in 1986 having offended powerful drug lords. Freedom of the Press, if it means anything at all, means the freedom to criticize and oppose . – George Orwell, writer. Quality journalism enables citizens to make informed decisions about their society’s development. It also works to expose injustice, corruption, and the abuse of power. For this, journalism must be able to thrive, in an enabling environment in which they can work independently and without undue interference and in conditions of safety. – UN Secretary-General Ban Ki-moon, UNESCO Director-General Irina Bokova, and UN High Commissioner for Human Rights Zeid Ra’ad Al Hussein. Take advantage of your rights and write a blog or social media post on something that you feel strongly about. Freedom of Speech is a crucial component of the UN Declaration of Human Rights. The internet has made sharing ideas with a wide audience the easiest it has ever been in history. Watch a documentary about the media and press freedoms. Some of our favorites: Spotlight (2015), Bowling for Columbine (2002), Page One: Inside the New York Times (2011), or Weapons of Mass Deception (2004). Get your inner journalist active on social media. The internet has given birth to a citizen journalist movement that harnesses the power of millions who previously had no voice. We all have cameras in our pockets and access to an audience of millions on social media. Read a book that tackles issues relating to freedom of expression. The famous works of George Orwell’s 1984 , Aldous Huxley’s Brave New World or Hunter S. Thompson’s Fear and Loathing on the Campaign Trail can offer some alternative perspectives on the function of media in society. Attend an event. There are dozens of events celebrating WPFD, these conferences bring together journalists and media workers to discuss current issues. UNESCO offers more monre info.